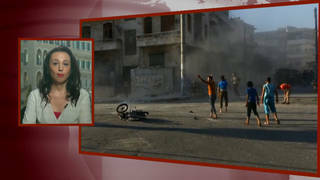 Bassam Haddad: We Have a Duty to Call for End to Killing in Syria & How We End It Matters | Democracy Now! director of the Middle East and Islamic Studies program at George Mason University. He is co-founder of Jadaliyya and director of the Arab Studies Institute. His recent piece for The Nation is headlined “The Debate over Syria Has Reached a Dead End.” He’s also the author of Business Networks in Syria: The Political Economy of Authoritarian Resilience. As the United States accuses Russia of bombing civilians in Syria, we speak with Bassam Haddad, director of the Middle East and Islamic Studies program at George Mason University. In an article headlined “The Debate over Syria Has Reached a Dead End,” he argues, “There has been increasing gravitation toward two mutually exclusive narratives: (a) that of 'pure and consistent revolution,' and (b) that of 'external conspiracy.' Both narratives carry grains of truth, but both are encumbered by maximalist claims and fundamental blind spots that forfeit any common ground necessary for enduring cease-fires or potential transitions, as well as post-war reconciliation.” Haddad is co-founder of Jadaliyya and director of the Arab Studies Institute. NERMEEN SHAIKH: We begin today in Syria, where airstrikes Wednesday killed at least 22 people, most of them schoolchildren. The attacks occurred in a village in Syria’s rebel-held Idlib province. According to reports by the Syrian Civil Defense rescue workers, the raids were carried out by either Syrian or Russian warplanes and hit a residential area and a school. SYRIAN MAN: [translated] Oh, God! Oh, God! God, please help us! Oh, God! Oh, God! You are seeing our situation! SYRIAN GIRL 1: [translated] I want my mother. Take me to my mother. SYRIAN GIRL 2: [translated] The plane hit us. I do not want to go to the school. NERMEEN SHAIKH: Also on Wednesday, United Nations aid chief Stephen O’Brien addressed the Security Council, saying the council has taken no action to end nearly six years of civil war in Syria. His comments sparked an angry exchange. STEPHEN O’BRIEN: Each month, I have come before you and presented an ever-worsening record of destruction and atrocity, grimly cataloguing the systematic destruction of a country and its people. While my job is to relay to you the facts, I cannot help but be incandescent with rage. Month after month, worse and worse, and nothing is actually happening to stop the war, stop the suffering. NERMEEN SHAIKH: Russia’s ambassador to the U.N., Vitaly Churkin, responded to O’Brien, describing his remarks as “arrogant” and criticizing him for not talking about Russia halting airstrikes in Aleppo. Several councilmembers, including the United States, France and Britain, defended O’Brien’s statements. This is U.S. Ambassador to the U.N. Samantha Power. SAMANTHA POWER: What is so remarkable and troubling about the presentation we’ve heard today is that what Russia really wants from the U.N. is credit. Congratulations, Russia, you’ve stopped, for a couple days, from using incendiary weapons. Thank you for not using cluster bombs in civilian areas. Thank you for staying the hand of brutality with regard to bunker buster weapons. You don’t get congratulations and get credit for not committing war crimes for a day or a week. AMY GOODMAN: This comes as U.S. Defense Secretary Ash Carter announced a military campaign to retake the Syrian city of Raqqa from the Islamic State. Carter said the campaign will commence sometime in the next few weeks, before the likely completion of the current offensive to defeat militants in the Iraqi stronghold of Mosul. Meanwhile, Syria continues to dominate foreign policy discussions in the presidential race. Donald Trump warned in an interview Tuesday that Hillary Clinton’s policy on Syria could lead to World War III. DONALD TRUMP: Well, she has no plan for Syria. And, look, with her you’ll end up in World War III. She doesn’t know what she’s doing, just like with Libya, just like with everything else she’s done. So, Syria now is no longer Syria. Syria is Russia and the new Iran, that we built through the Iran deal, which is the worst—one of the worst negotiated deals I’ve ever seen. NERMEEN SHAIKH: NATO is seeking to station more troops in eastern Europe in what’s been described as the biggest military buildup on Russia’s borders since the Cold War. As part of a U.S.-backed plan, NATO is planning to send battle groups to Poland, Lithuania, Estonia and Latvia, with forces ranging from armored infantry to drones. As tension mounts between Russia and the U.S. over the crisis in Syria, National Intelligence Director James Clapper said Tuesday he fears Russia could shoot down a U.S. aircraft if a no-fly zone were to be imposed over Syria. AMY GOODMAN: Well, our next guest says that two mutually exclusive, competing narratives are dominating discussions around Syria—and neither is sufficient to understand what’s happening in the country. In a new article in The Nation headlined “The Debate over Syria Has Reached a Dead End,” Bassam Haddad writes, quote, “There has been increasing gravitation toward two mutually exclusive narratives: (a) that of 'pure and consistent revolution,' and (b) that of 'external conspiracy.' Both narratives carry grains of truth, but both are encumbered by maximalist claims and fundamental blind spots that forfeit any common ground necessary for enduring cease-fires or potential transitions, as well as post-war reconciliation,” he writes. Bassam Haddad is the director of the Middle East and Islamic Studies program at George Mason University and is director of the Arab Studies Institute. We welcome you to Democracy Now! So, why don’t you lay out what these competing narratives are and why you call this a dead end at this point? BASSAM HADDAD: Thank you, Amy, for having me again on the show. I simply was trying to—tried to establish some sort of accountability on behalf of the people that push certain arguments or narratives on both of these sort of dominant sides. What I call the “pure revolution” narrative is, of course, some sort of a shortcut to a much more complex position. Both of these depictions are. But in all cases, it represents a view that assumes that, from the very beginning of the uprising or revolution, the same values that actually existed at the time have been sustained throughout the last five-and-a-half years by the rebels and so on, whereas, in reality, the actual uprising has been transformed into what we are seeing today, to avoid the nomenclature of what is exactly happening today in terms of giving it a name. And that also reveals another shortcoming regarding the actual, of course, external intervention on behalf of the opposition that has short-circuited the opposition, that has rendered it less unified, less transparent, less inclusive and, most detrimentally, less independent. They also have a problem, the proponents of a pure revolution narrative, in trying to disentangle the good rebels from the bad rebels, if you will, or the jihadists from the nationalists within the rebel groups, but it is extremely difficult to disentangle these two, as it is extremely difficult to disentangle Syria today from the problems that we are witnessing in the region. On the other side, we also see a dominant narrative—and, of course, there are many other narratives, but these are the ones that you are always confronted with when you talk to anybody about Syria, whether it’s a family member, a policy analyst or a friend. The other narrative focuses on a conspiracy excessively, focuses on external designs on Syria excessively, as if there is no reason for Syrians to actually rise up on their own and basically struggle for ending a four-decade repressive regime, not just politically, but also economically. And it does this at the expense of Syrians, because it sees external imperialist forces, which do exist and have actually wreaked havoc in the region to the nth degree, but it only sees those forces, and internally it sees, for the most part, jihadists. And what disappears in this narrative are ordinary Syrians that are actually opposed to both. Syrians, in this narrative, become invisible. And if you try to hold a position that rejects this sort of pure revolution narrative, which is unrealistic and difficult to accept when you are looking at what’s happening on the ground, or when you try to reject the conspiracy or external designs narratives, you are basically accused of being either a traitor to the nation or an imperialist or even a jihadist. And you’re not allowed to oppose the regime, for instance, from a perspective that is different from that of the opposition. And you’re not allowed to be in the opposition to the regime without being labeled a pro-West, pro-U.S., pro-imperialist speaker or advocate. And that puts us in a situation that prevents the development of a middle ground that—as cliché as it sounds, that puts Syria first, over and above all these designs. What is at stake here is not what is happening now, because the regime, as we see it today and as we saw it in the past several decades, is not going to be part of Syria’s future, no matter how much everyone insists on that side that it will be. It’s actually, for the most part, a bargaining chip to use during negotiations to increase the leverage of that side of the argument. What might stay with us, however, is the new configurations that you are witnessing developing in Syria, including various groups that are externally supported and funded. These kinds of movements, in my view, will stay with us for the long haul, and this is why there’s a lot of controversy about what should not be controversial, which is a democratic uprising against a dictatorship. But things have become so complex that to actually rid the real world of this complexity and just focus on the ideals is actually counterproductive for the purposes of an uprising itself. AMY GOODMAN: Bassam Haddad, there’s so much to discuss. We’re going to break and then come back to this, director of the Middle East and Islamic Studies program at George Mason University. This is Democracy Now! We’ll be back in a minute. AMY GOODMAN: “Ya Haif (O, Shame)” by Samih Shuqair, here on Democracy Now!, democracynow.org, The War and Peace Report. I’m Amy Goodman, with Nermeen Shaikh. AMY GOODMAN: Our guest is Bassam Haddad, director of the Middle East and Islamic Studies at George Mason University, co-founder of Jadaliyya and director of the Arab Studies Institute. His recent piece in The Nation is headlined “The Debate over Syria Has Reached a Dead End.” He’s also author of Business Networks in Syria: The Political Economy of Authoritarian Resilience. Nermeen? NERMEEN SHAIKH: So, Bassam Haddad, you were speaking earlier about all the parties who are intervening in the conflict, both on behalf—on the side of the Assad regime, as well as the opposition. So could you explain who those parties are and how they’ve impacted what started off, as you pointed out, as an uprising against the Assad regime in 2011? BASSAM HADDAD: I mean, the actual development of the uprising early on—and there’s also debate about that, because various groups already had existed in Syria, thanks to Bashar al-Assad and his efforts to facilitate the passage of international and regional jihadists into Iraq since 2003. However, the uprising itself started as a legitimate call for democracy or for social justice or for the end of economic exploitation and corruption, against a regime that has been in power for several decades, had plenty of opportunities to turn Syria into something that actually prevent, quote-unquote, “penetration and intervention” from the outside at the scale that we have seen. But it has actually done the opposite, making its subjects, citizens, very vulnerable to its rule and setting them up to perhaps call for any external intervention to fight the regime. That, however, has been exploited by various groups in the region or various states in the region, and beyond, to use the uprising, perhaps hijack it, for its own purposes, for their own purposes, and sort of turn the Syrian question or the Syrian revolution or uprising into an arena that is used to redraw the political map of the region. That process, as well as the brutality of the regime in crushing the opposition or crushing the protests early on, escalated and exacerbated the transformation of the uprising into something that is more militant, more extremist, more—ultimately, more jihadist, in due time. And that constituted one of the tracks that needs to be taken very seriously as we speak about a future for Syria and as we speak about ways of coming out of this conflict. The brutality that we have seen by the regime is not something new. It is not something that can be explained by addressing international intervention only. It is a manifestation of how the regime operates when it’s under threat. And it’s not just the identity of the opposition that makes the regime act this way. The regime would act this way when faced with any threat. It could be Mother Teresa or a Marxist movement; it would react in the same manner. What complicates the situation and what makes this a difficult, intractable context is the identity of the supporters of the uprising and the revolution, which includes conservative, oil-rich countries like Qatar and Saudi Arabia, and their external allies, including the United States and as well as Turkey early on, which helped actually bring in thousands of external fighters. The identity of these players, of these supporters, has turned this into a conflict that is much larger than Syria. It became a conflict that is much more than just about Syria. And if we don’t realize this development and the implications of this development, we will be—if we don’t have this diagnosis, in my view, we will be suggesting solutions that actually do not work. They might be even counterproductive. We all, I think, have a duty, moral, political and intellectual, to call for the end of the killing. The manner in which we call for this, however, actually matters, because some of these calls are not going to be heeded. A lot of calls, for instance, address the United States as if the advocates of democracy and independence for Syria have the same interests as the United States, and they do not. The history of the United States’ involvement in the region shows otherwise. So, it is not about calling or not calling for the end of the killing. That is not an issue. The end of the killing and the end of the massacres and the end of the atrocities, committed mostly by the regime, at this point, and the Russians, especially at this point, I should say, is a no-brainer. There is no individual that will actually say, “No, let us go on,” unless they are firmly on the regime’s side in a way that actually doesn’t take the interests of most Syrians into consideration. The question is: How do we go about doing that? And it’s important to actually descend from our lofty ideals and our grandstanding, you know, statements to discuss the complexities of the situation, which, actually, unfortunately, will not be to the liking of any party. But that is the problem. We are looking for a solution that satisfies one party exclusively, and it’s not going to happen, especially after fall 2015, when the Russians intervened on the side of the regime and prevented any potential collapse. We are stuck in a situation where the best option is the suboptimal outcome. This is extremely depressing in view of the killing that’s taking place. But it is not something that we can negotiate, unless there is a tectonic shift that we cannot anticipate in Syria, and especially before the elections or before the transfer of power in the United States. AMY GOODMAN: Professor Haddad, you talk about the other countries and also that you can’t solve Syria without dealing with Yemen and Iraq. I wanted you to respond to Patrick Cockburn, who made this comment that you should compare the coverage of Mosul and East Aleppo; it tells you a lot about the propaganda we consume. Your thoughts on this? BASSAM HADDAD: I did not see that particular piece. I know the—I heard about the headline. But it is not also a—either a puzzle or it is not surprising. The coverage, whether it is by Arab satellite stations or our mainstream stations here in the United States, and perhaps in Europe, have actually approached the Syrian situation in such a manner that highlights excessively and exclusively certain atrocities, which are, in fact—and that is no, you know, surprise—which are, in fact, committed by the regime and its allies, especially Russia at this point. But when it comes to other kinds of conflicts, which involve the bombardment of civilians, as well, by those who are supporting the rebels in Syria, such as Saudi Arabia and the United States, that is fueling and refueling Saudi Air Force or jet fighters as it bombards the rebels and civilians, this sort of coverage, on Yemen, is actually not just lacking, it’s almost absent, with the exclusion of major atrocities such as we have witnessed or heard about a couple of weeks ago with the killing of several hundred civilians or Yemenis on the side of the rebels by Saudi jet fighters. As far as Mosul is concerned, it’s actually a similar issue, except, in the case of Mosul, there is a consensus against ISIS. But the manner in which the media proceeds in producing propaganda, that completely eliminates what is being addressed or what is being argued on the other side, is actually horrendous. And this is something that has fed into this solidification of these binary narratives on Syria, the dominant ones. I mean, there are many other ways of understanding Syria, and there are ways that are more productive. It’s just that they are drowned out by propaganda, by the the sound of the—of guns and jet fighters and bombs. And it is no wonder why today even a brother and a sister within one family, in Syria or outside Syria, who care about the Syrian situation, are actually on complete opposite ends of the spectrum in addressing the problem and the solution. NERMEEN SHAIKH: Well, I’d like to turn to an excerpt from the book by Robin Yassin-Kassab and Leila al-Shami titled Burning Country: Syrians in Revolution and War. The authors explain how extremist groups grew to such prominence in the Syrian opposition, writing, quote, “If the FSA“—that is, the Free Syrian Army—”had been seriously supported from outside, if Assad had not been so generously armed and funded by Russia and Iran … then the armed struggle might have lasted months rather than years, and civil activism might have quickly regained its role. But the war stretched on, and the liberated areas became death zones. This was the vacuum in which jihadism would thrive.” So, Bassam Haddad, I’d like you to respond to that, as well as the claim that some make that if the U.S. hadn’t intervened and pushed for arming various groups, the Syrian opposition would not be in the state that it’s in, while others say that the U.S. didn’t support the opposition enough. BASSAM HADDAD: Yes, I mean, it kind of goes both ways. But it’s very important, in my view, to take that position seriously, the position that, had the U.S. supported—which actually involves a readiness to support the intervention of the U.S., which has been intervening in many ways that are not discussed, as if the U.S. is just sitting on the sidelines. It is not. It has been arming groups, and it has been signaling other countries to arm groups, and it has actually engaged itself in direct combat. But it’s very important, even if one disagrees, to take this proposition seriously. The problem with such propositions, because they are emotionally—they sound emotionally correct. The problem with these propositions is that they don’t actually gel with the political realities on the ground, and they don’t actually comport with historical experience. For instance, the idea of, had the U.S. supported the Free Syrian Army early on, things would have been different, and a vacuum wouldn’t have been grown in which the jihadists were able to fill, has two issues, has two problems, at least two problems that I can—that I can immediately think of. First, it assumes that the opposition is not a fragmented—the rebels, by late 2011 or 2012, were not already a fragmented whole, and it assumes that there is a central command that can actually take care of this sort of support and do something with it. But that’s not the most important problematic assumption. The other assumption—and if you look at the history of support for rebel groups, the other assumption is that there is consensus among all possible interventionists on supporting the rebels. But there is not. The interventionists are actually split. So, supporting the rebels early on, in however scenario we can imagine, would have actually led not to a success of a rebel movement against the entrenched, brutal, authoritarian regime; it would have led instead to an escalation and an arms race, because the supporters of the regime would have naturally came in earlier with much more viciousness, much more force, to actually respond by supporting the regime in similar, if not in more extensive, ways, for reasons that we are witnessing right now. The support of the regime so far has been much more vigorous and bold about going farther than the supporters of the opposition. So, those two assumptions do not hold. Maybe in a reality in which the rebels are supported by the most powerful possible interventionists across the region and the world, that would have actually made sense, but it actually doesn’t hold water in the real world, given Syria’s allies. AMY GOODMAN: Professor Haddad, we have to wrap up, but you mentioned the U.S. elections. What do you think will change based on who is elected president here? And do you think that Assad out, regime change in Syria, is a prerequisite for change there? BASSAM HADDAD: I think—I think if Trump actually wins the presidency, everything is going to be OK.
No, I’m joking. No, I think we have a serious problem in the sense that we expect so much out of the elections and out of new administrations in the U.S. And I’m not saying things will not change, but I think there is a consistency in U.S. policy that will not be subverted simply by the coming to power even—even of a personality such as Donald Trump. What will change, I think, is not necessarily the best way to look at this. The best way to look at this is: What is the state of the battlefield in Syria and the state of the international moods vis-à-vis what is happening in Syria by the time Clinton or somebody takes over? And that is why the Russians and the Syrian regime are pushing for a most brutal assault, which I think we haven’t seen yet mature, but we probably will, unfortunately. They are pushing for this assault in order to take Aleppo, control what is called “useful Syria,” suriya al-mufida, and use that as a—as leverage for any kind of negotiated settlement that might take place later on, if at all. And by that time, it will actually have raised the bar so much for a U.S. intervention that it would be very difficult to do very much, perhaps besides some sort of settlement, unless an all-out confrontation or war is on the table. But it is not on the table now as a function of the problematics of enforcing, for instance, a no-fly zone, which is very close to going to war with Russia, which many policy wonks today, or in the past week, for instance, have been saying, “Oh, it’s not such a big deal. The U.S. can take out Russia,” and we are underestimating how the threat of credible force by the U.S. will actually affect Russian responses. Perhaps. But also perhaps not. BASSAM HADDAD: Sure. The point is that I think that what happens on the ground in the next few weeks, in my view, is going to be horrendous. It’s going to be brutal. And it’s going to—or at least the Russians and the Syrian regimes are going to attempt to set the stage for some sort of an irreversible situation territorially. And instead of—in my view, instead of calling for the U.S. to enter into the war, the U.S. can actually place hard pressure on Russia to force its proxies to come to a negotiated settlement in which all forces—all social forces in Syria can actually have a role. And the problem is that the U.S. is probably not willing to do this. It’s not ready to do this yet, because it will have to make compromises that it hasn’t been ready to make vis-à-vis its own allies and vis-à-vis its other projects in the region, including in Yemen and elsewhere. AMY GOODMAN: Bassam Haddad, we want to thank you for being with us, director of the Middle East and Islamic Studies program at George Mason University. That does it for this discussion, though we will certainly continue to follow Syria. We’ll be back in a minute.